Poetry that Moves – CONNECT! I cultivated a love for poetry at a young age, but for many people it is an inaccessible genre that is tedious to read, nonetheless teach. Although it’s not everyone’s cup of tea, I’m convinced poetry appreciation and creation relies on effective communication. If a person clearly conveys something meaningful through a form as fluid and pithy as a poem, they have engaged in an artistic process that places them in the company of great writers. When my partner teacher Rick and I conceptualized this poetry unit, our goals were to improve student communication skills, add an undeniably engaging element, and have the class authentically experience creative writing. It seemed fitting that today’s highly visual and technologically savvy generation would transform the concept of a concrete poem and digitally bring it to life. Our Grade 6 Humanities classes completed a three step writing method that culminated in a kinetic poem. Each phase required students to delve deeply into their thoughts and wonders, broaden their knowledge of poetry and powerful writing, become familiar with different computer programs and websites, and tap into their creativity. Students documented their work using the online notebook program Evernote which was synced and shared so we could monitor progress instantaneously. We placed emphasis on the process rather than the product and assessed students by giving them formative feedback on their written reflections completed after each phase. The student’s ability to communicate their understanding and experiences was our evidence that meaningful learning took place. 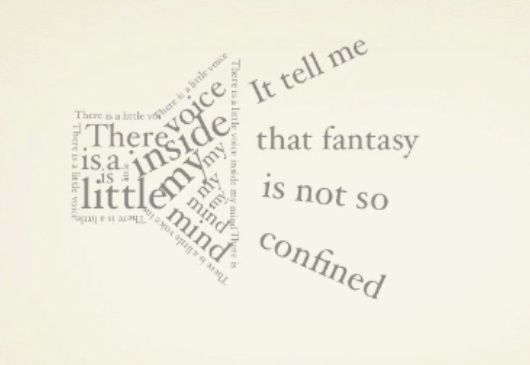 To bring their poems to life, students used Keynote to create text animation. I was amazed how quickly they mastered the program and how they naturally collaborated to share their knowledge. Watching the finished products proves that richer language was used to communicate deeper messages and this makes these poems worth producing. This was a really amazing project. I was impressed with the technical aspects of their presentations and moved by the power of their words. Great work! This is an amazing poetry unit. I would like to ask your permission to use these ideas for my grade 8 students. Thank you for sharing this so openly. It is a wonderful way for students to learn, research and communicate in a creative and artistic way. @Deanna – We would be very pleased if your Grade 8's used our ideas for a unit of your own. Depending on your access to technology, we would be willing to have our students support your students in any way they would require. Please feel free to contact me through the CSS website if you decide to move forward with an animated poetry project. @ Garry – Thank you for your thoughtful comment. Lisa and I really appreciated the opportunity to showcase the student projects in the company of the Board. @ Scott: Thanks. It was impressive seeing what they were able to accomplish through Keynote. I think this is only the tip of iceberg. I would love to use this idea with some Grade 5 students. Is there a chance to share the resources and teaching materials for this project. I went to the link and the information is no longer available! The link on this website has been archived but I have all of the materials we used. Could you please send me the resources for you unit, looks very cool, great work!